Jude Rothesay stands out in his small town for all the wrong reasons. Everyone at school knows his name, but only because he’s the flamer who wears makeup to school, and openly crushes on the decidedly straight Luke Morris, to the disgust of his peers. Jude defiantly laps up their attention and even throws gas on the fire, because anything is better than being invisible. He stokes their hatred, turning it into fuel for his imagination, which transforms his life into a glamorous movie. Jude can’t wait to escape to Hollywood, where he is sure he will become a big star, but only if his small town doesn’t eat him alive first. Jude’s reality is depressing enough to make his escape into imagination more than understandable. In addition to the bullying at school, his home life is tense thanks to an abusive and homophobic step-father, who his mother refuses to leave. Jude spends as much time as possible away from home, but in his small town, entertainment consists of alcohol and drugs, and hook ups with boys who can’t admit they might be gay. Jude has some support in his best friend, Angela, but theirs is a complicated relationship. Angela’s acceptance of Jude’s sexuality stretches only to a point, because she desperately wants him to be in love with her. Even as she needles Jude about the impossibility of his crush on Luke, she can’t cop to the absurdity of her own feelings. Jude’s decidedly cold assessment of Angela is that she’ll never make it out of their small town because she will be pregnant before graduation. The only untarnished character in this story is Jude’s half-brother Keefer, who looks up to his big brother despite all of the ambient homophobia threatening their relationship. Jude returns Keefer’s affection, but with some reservation, because he knows that he can’t wait for Keefer to grow up before he makes his escape. He simply won’t survive there for that long, and that means being able to leave Keefer behind. Despite Jude’s snarky humour, the unrelenting darkness makes this a challenging read. Even Jude’s supportive English teacher, another faint bright spot, is tainted when he crosses the line and kisses his student. When Everything Feels like the Movies is uncomfortably and deliberately provocative, just like Jude himself. It is Jude’s refusal to apologize, back down, or edit out the potentially offensive details that has made this novel controversial. But while Jude tries to put a filter of glamour over his life, the brutal reality he is trying to efface only looks all the more stark to the reader for his efforts to ignore it. 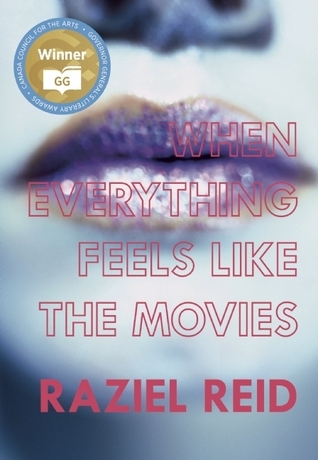 At the beginning of the week, When Everything Feels like the Movies topped the poll about which book Canadians wanted to see eliminated first from Canada Reads 2015. Like Cockroach, which was similarly unpopular last year, it made it to the final round thanks in large part to a passionate defender. Elaine Lui touted the title as the one book to break barriers of homophobia, bullying, and ageism, and staunchly defended it against accusations of vulgarity. In the final round of debates, host Wab Kinew asked all the panelists to identify what they liked about each of the remaining books. When Everything Feels like the Movies was lauded for being challenging and honest, with a powerful voice that uses humour to counterbalance a dark reality. However, there still seemed to be some lingering uncertainty about whether the book would be able to break barriers if a significant number of Canadians couldn’t get past the offensive language or cope with an unlikeable protagonist. Ultimately, the other panelists voted unanimously against defender Elaine Lui, crowning Ru by Kim Thuy as the winner of Canada Reads 2015. Check back tomorrow for my review of the winning book!